PRODUCT: 5-1/4 inch diameter X 5-3/4 high Replacement UV resistance BLACK Polyethylenet Drain Dome / Strainer / Drain Grate. Twist-N-Lock Style. Replaces popular 5 in. 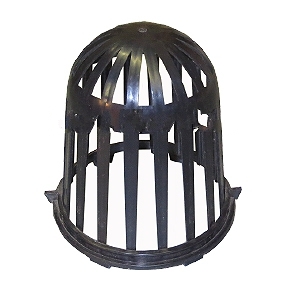 plastic Drain Strainer Domes. Price/Each. APPLICATIONS: REPLACES 5" PLASTIC TWIST-LOCK STRAINERS ON MOST POPULAR DRAIN.